In 1935, just two years after the Nazi party seized power in Germany, Hitler was already at work shaping the country into his image. That year saw the passing of the Nuremberg Laws, a series of anti-Semitic measures to subjugate and abuse the Jewish population. 1935 also marked the first of five separate Neutrality Acts passed by U.S. Congress that barred any American involvement in overseas conflicts. In the midst of perpetrating crimes against humanity, Germany marketed itself as "the healing country," full of rejuvenating resorts and spas. "Happy and gay is the life at these fashionable watering places," the ad copy reads, mentioning the inflation-free "Registered Travel Marks" offered to American tourists. Noticeably absent from these advertisements are any swastikas (which became Germany's official flag in 1935) or mention of the Nazi party or government. 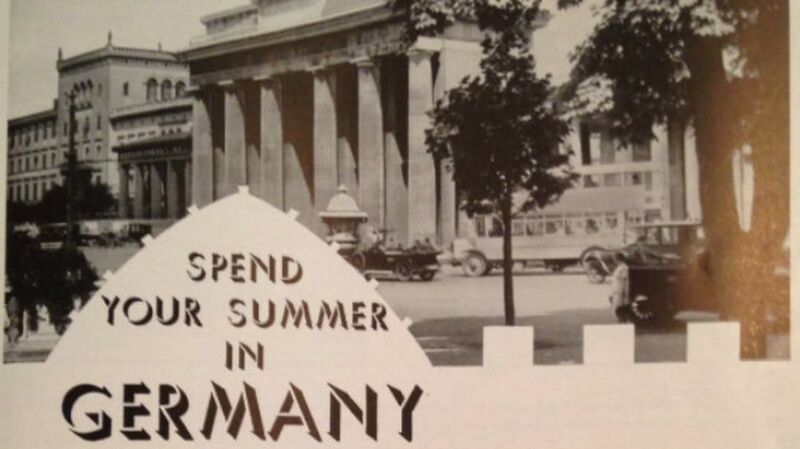 If one were to believe the ads he or she read in 1935, Germany would be a land of spa treatments, friendly cruises, healing health resorts, and nothing more.